…we will be enjoying a rootin’ tootin’ fun evening of Dinner by Lucille’s Smokehouse BBQ, Drinks, Music, Dancing, Live Auction, Silent Auction, & Games… all to raise money for our very own amazing H. Clarke Powers Kodiaks & school! Tickets will start selling THIS FRIDAY 2/8/19 after school 2:00pm - 2:30pm in the Parent Plaza (in front of the gym)… Look for the cowboy! 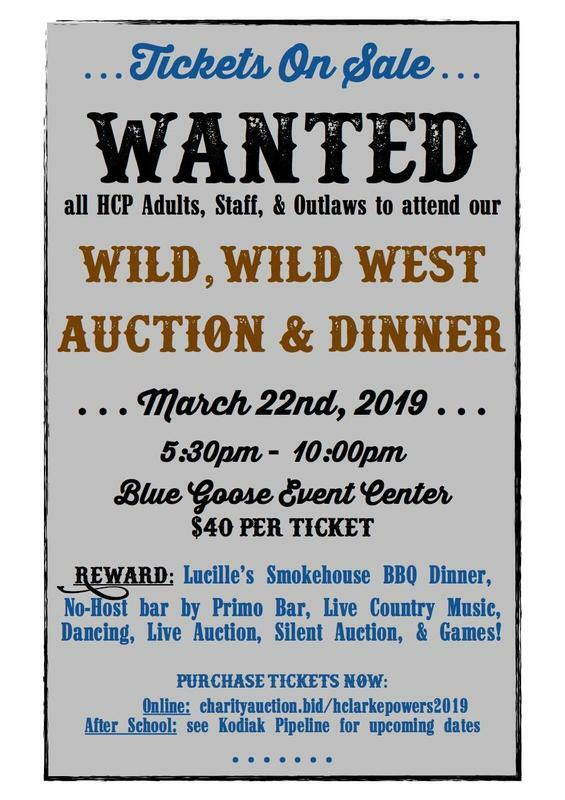 There will also be an opportunity to Sponsor a Teacher by purchasing their Auction ticket and giving them the gift of a night celebrating with the families that love & appreciate them! Our auction volunteers have been working hard creating and coordinating this fun event and we NEED YOUR HELP too! This year we’re having a “GIFT CARD RECYCLE & DONATION” collection. Do you have gift cards laying around the house, napping in a junk drawer, or hiding in your car’s center consul… not yet used? Wouldn’t you love to donate them to your child’s school to be added to a fun prize or auction basket raising money for our Kodiaks? Easy right?!?!! If you’d like to participate in donating unused gift cards please bring them into the HCP front office! For more information & upcoming details follow us on Instagram @hcpauction & our HCP PTC Facebook page. We’re thrilled for you to join us for this wild, wild evening full of fun & support for our amazing school, staff, & AWESOME KIDS!! !